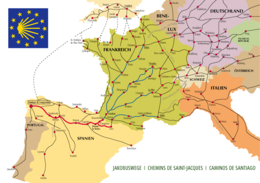 The Way of St. James or St. James' Way (Spanish: El Camino de Santiago, French: Chemin de St-Jacques, German: Jakobsweg, Basque: Done Jakue bidea) is the pilgrimage route to the Cathedral of Santiago de Compostela in Galicia in northwestern Spain. Tradition says that the remains of the apostle Saint James are buried there. ↑ "Looking For Infinity: El Camino Official Film Website". This page was last changed on 5 April 2019, at 13:53.